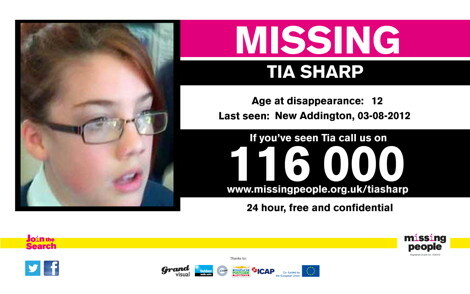 A couple of missing person stories have been prominent in the UK press these past few days and it’s good to see that the Outdoor Media Centre’s ‘Missing Person Billboard Campaign‘ is continuing to be put to good use. In the case of Tia Sharp we note that Amscreen’s creative (shown above) has been live since this morning, it’s now running on a massive 1,160 sites across the UK and perhaps more importantly that includes all 19 sites in the specific local area. This entry was posted on Tuesday, August 7th, 2012 at 14:47 @657 and is filed under Scuttlebut. You can follow any responses to this entry through the RSS 2.0 feed. You can leave a response, or trackback from your own site.